We’ve created a shower pack of essential items based on natural ingredients - including our Scalp Care Shampoo and Scalp Care Conditioner to keep hair healthy, soft, luscious and easy to manage and leave the scalp feeling fresh, clean and comfortable, and our Complete Skincare Body Wash for shower or bath to gently cleanse and exfoliate while maintaining optimum skin health. When it comes to hair care we know that both hair and scalp need to be well maintained - they go together as far as health and well-being are concerned. Our Scalp Care Shampoo and Scalp Care Conditioner provide the perfect combination of a specially formulated shampoo and conditioner containing natural ingredients, designed for good hair care and managing the discomfort of sensitive, dry, flaky or itchy scalps. Our Complete Skincare Body Wash uses natural ingredients brought together to give you a gentle and effective all-over clean. McArthur Skincare's Scalp Care Conditioner has been created as the perfect partner to our Scalp Care Shampoo. 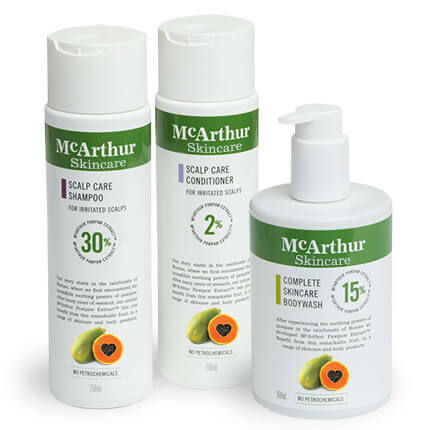 Our McArthur Skincare's Scalp Care Conditioner is formulated for sensitive, dry, flaky or itchy scalps. Our Complete Skincare Body Wash provides a gentle, refreshing and effective all-over clean that’s well suited to all skin types, including sensitive skin. Containing 15% McArthur Pawpaw Extract™ this moisturising body wash cleanses, exfoliates and revitalises pores and skin, leaving the skin clean, soft and smooth. The active natural ingredient of the Scalp Care Shower Pack is Pawpaw (Papaya, Papaw). The products in the pack also contain a variety of other natural ingredients - some derived from Coconut, Citrus Fruits, Rice, Corn, Wheat, Olive Oil and Bamboo. Pawpaw (Papaya, Papaw) is the skin’s natural friend, packed full of vitamins, antioxidants and enzymes. Our hair care and body wash products contain higher concentrations of Pawpaw extract than other products we’ve seen on the market. McArthur Pawpaw Extract™ is manufactured only by us and some customers refer to it as liquid gold! 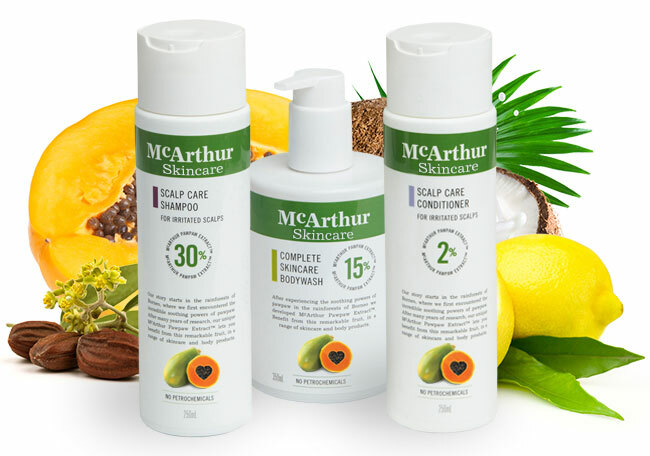 McArthur Skincare's Scalp Care Shower Pack has been created to harness the active natural ingredient, Pawpaw (Papaya, Papaw) in our highly concentrated McArthur Pawpaw Extract™. This value pack helps maintain hair, scalp and skin in good condition so your hair looks and feels natural, nourished and vibrant, your scalp feels soothed and comfortable, and your skin is revitalised. All products in the McArthur Skincare Hair Care and Skin Care ranges use natural ingredients. Active natural ingredients have been carefully selected and blended by our McArthur Skincare specialists to create our Scalp Care Shower Pack while avoiding harsh additives.